A neurological reflex depends on an arc which consists of an afferent pathway, which is activated by a specific receptor, an efferent system, which activates a stereotyped response, and a simple or complex pathway that interconnects the afferent and efferent systems. Since the reflex response to an appropriate stimulus is involuntary, disturbances of reflexes afford objective signs of neural dysfunction. The deep tendon reflexes of the limbs provide essential information about Lhe status of the central and peripheral nervous systems. They are phasic stretch reflexes which involve only two neurones. Being monosynaptic the deep tendon reflexes are subserved by a particular spinal cord segment. However, suprasegmental influences modify activity of the reflex arc. Reflexes are evoked by sudden stretch of a muscle. This activates the muscle spindles, which produce an afferent volley that travels up 1A fibres, which enter the dorsal born of the spinal cord and synapse on an ¡i-motor neurone in the ventral horn of the cord, Excitation ol the neurone leads to direct activation and contraction of the muscle. Fig, 6.31 Eliciting the biceps jerk, C5 (C6). Fig. 6.32 Eliciting the triceps jerk, C6, C7. their segmental innervation in Figures 6.31-6.36. 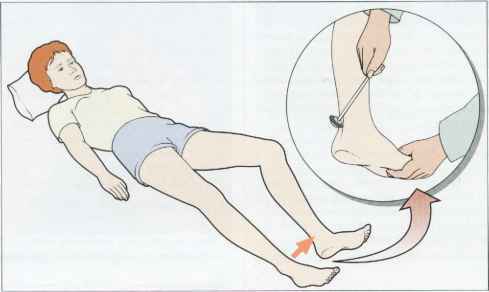 The ankle jerk is usually elicitcd in the position shown in Figure 6.35. However, if the patient has difficulty in relaxing. Ihe position shown in Figure 6.36 is particularly useful. Other deep tendon reflexes which may be useful occasionally include the deltoid reflex (C5t. the pectoral reflex (C7), the finger flexion jerk, the Hoffmann reflex (C7.CK.TI), and the hamstring jerk (L5.S1). Deep tendon reflexes arc classified as hyperactive (+++), normal (++), sluggish (+) or absent (-). If a reflex is present only with reinforcement it may be annotated as ±. It is only from examination of a large number of patients that the clinician will get a feel for the normal spectrum. Fig. 6.34 Eliciting the knee jerk (note that the legs must not be in contact with each other), L3, L4. Fig. 6.35 Eliciting the ankle jerk at recumbent patient, St. Fig. 6.37 Reinforcement in eliciting the knee jerk. Fig. 6.36 Eliciting the ankle jerk of kneeling palient, S1. □ Ensure that the muscle being tested is visible. □ Strike the tendon, not the muscle belly, with a sharp tap from a tendon hammer. □ Observe the muscle contraction. □ Test the symmetry of the reflex by comparing the amplitude of movement on one side with the other. 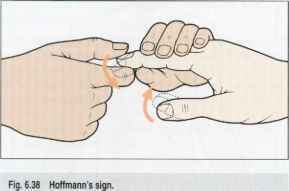 □ In those patients in whom relieves are difficult to elicit or appear to be absent, use the technique of reinforcement: for lower limb reflexes ask the patient to interlock the flexed fingers (Fig. 6.37). Then ask the patient to 'tighten' immediately before striking the tendon and to relax thereafter. clench the teeth or squeeze the knees together whilst the tendon reflexes are being elicited, and to relax immediately thereafter. □ Place the tips of the examiner's middle and index fingers across die palmar surface of the proximal phalanges of ihe patient's relaxed fingers. □ Tap the examiner's fingers lightly with a tendon hammer. The normal response is slight flexion of the patient's lingers. This becomes exaggerated if there is hyperreflexia. □ Place the examining right index finger under the distal interphalangeal joint of the patient's middle finger. □ Briskly flick down the patient's fingertip with the examining right thumb tip, and allow it to spring back to the normal position while observing the patient's thumb for any movement (Fig. 6.38). Reflex flexion of the thumb is exaggerated in hypcrrcflexion. □ Place the examiner's extended index and middle fingers on the lateral border of the pectoralis muscle. □ Tap them with the tendon hammer. □ Place the examiner's index finger across the tip of the shoulder (on the deltoid muscle belly). □ Tap the examiner's finger with a tendon hammer. When is the ankle jerk reflex exaggerated? How to do finger jerk reflex? What receptor is activated in ankle jerk reflex? 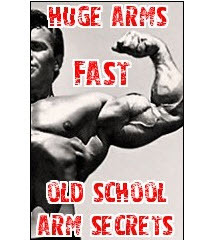 Is an exagerrated ankle jerk reflex ok? What is the number range for ankle jerk reflex? How to elicit ankle jerk?